Salt is it good or bad for us? Let's go to the Bible first. “Salt is good, but if salt has lost its taste, how shall its saltiness be restored? EDUCATE: If salt was bad for us then God would not have told us it was good for us. Like most things the salt we know today has been changed from what people used for thousands of years. Bad Salt: Refined salt that you see as a white grain in a shaker has been harvested from salt mines as brine, which means salt in water. Chemicals are added to the brine to remove the minerals. Then the brine is evaporated using high compression and heat. This changes the molecuar make-up of the salt. Then often toxic chemicals are added to prevent clotting and then iodine. "Pure" salt means it is 99.7-99.95% sodium chloride. This means man once again has made a lifeless product out of God's creation. This dead salt has a longer shelf life and looks pretty and white, but does not respond well in most human bodies: high blood pressure, swelling, etc. Good Salt: All natural salt is not white, but still pretty with colors of pink, gray, white, and brown. These different colors are a mixture of minerals. 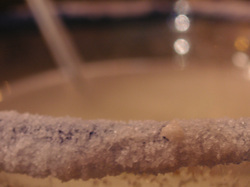 Celtic Sea Salt has been tested to have a high percentage of minerals. Redmond's Real Salt comes from mines in Utah. To see all the minerals included: http://blog.realsalt.com/wp-content/uploads/2010/07/realsalt_analysis.pdf. EMPOWER: God designed man to have a natural craving for salt. All natural salt is loaded with minerals. Our bodies require lots of minerals and those minerals need to be balanced. When their is an imbalance of minerals, our bodies begin to break down, the pH of the body becomes unstable, immune system goes awry, sleep patterns are disturbed, hormones go crazy. A balance of minerals is critical for good health. ENJOY: I did not use salt in my cooking for years because my fingers would swell up and look like sausages. Today I use Real Salt and do not have this problem. My food is flavorful, all natural, and we are enjoying God's wonderful creations. Today, start your journey with good salt and enjoy.